The Wadawurrung people, traditional owners of this area, named the bay ‘Jillong’ and the land surrounding it ‘Corayo’. Jillong means ‘a place of native companions’, or ‘place of the cliff’, representing Geelong quite well. These words have now formed into Geelong and Corio Bay, as we know them today. Many other parts of Geelong also have maintained their Aboriginal names, including Kardinia, meaning ‘break of day’, the You Yangs meaning ‘big mountain in the middle of a plain’, and the names of streets in town such as Malop, Gheringhap, Moorabool and many others. It is nice to see that Aboriginal names for places have remained, and every time I use one, it does make me reflect about Australia’s First Nations people, the custodians of this land. It’s almost necessary to look back on Geelong’s history to see the great town it has become today. Geelong’s main currency was wool, with many of the buildings in the CBD harking back to these times. The Deakin University Waterfront Campus (where I attend), the National Wool Museum and Lamby’s (get it?) below, the Westfield building and other landmarks of Geelong were all built upon the wool industry. Geelong had been an industrial centre for decades, building cars, oil refineries and many manufacturing plants. As Geelong has grown up, it has become more and more of a metropolitan society, with large companies moving their head offices to Geelong, such as WorkSafe recently. 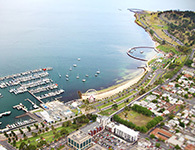 Geelong was considered a ‘sleepy hollow’, looked down upon by Melbourne, but as time has gone on the city has become an icon in its own right, earning a strong rivalry against the bigger capital of Victoria. So, what makes Geelong as groovy as it is today? For me, it’s the location. Living in a coastal town definitely has its perks. The infamous Torquay and Bells Beach is only around 30 minutes down the road, and with the Great Ocean Road at your fingertips, it’s great to be able to enjoy a weekend away in completely different scenery without being that far from home. The beach is a great experience in the summer time, there’s nothing better than walking along and enjoying the great view. There are a heap of different beaches to choose from as well, so you’ll never get bored. Geelong itself is a beautiful place to live! The maintenance of the Waterfront, with the gorgeous Steampacket Gardens and Eastern Beach’s art deco boardwalk is an absolute pleasure in the summertime, and gorgeous in winter when the mist sets in. It has all the metropolis of Melbourne, without the traffic and the noise. It’s really a perfect combination of country and city living wrapped in a nice little bow. Pakington Street is another one of my favourites. The variety of shops, culture and atmosphere is amazing to walk through, with little boutique cafés and gourmet groceries. There’s always something new to try or explore in Newtown! For me, the education in Geelong is pretty neat as well. The gorgeous Deakin Waterfront Campus is not only pretty to look at and learn in, it also has great facilities and great student and staff support. It’s a great setting to live and learn in, and far cheaper than Melbourne as well. If all this hasn’t convinced you Geelong is one of the best places to live in Victoria, you’re missing out big time! It’s an unreal place to live and learn and I’m stoked that I am lucky enough to study here. Hopefully if you are reading this, you’ll feel the same way too!